Looking west from Seattle, The Brothers rises up from the sound to 6650 ft. The East Basin is the obvious line from the top and even from 40 miles away is clearly a sicky. After a very wet March and April with few breaks in the weather, Easter Sunday was forecasted for sun so we camped out at the Lena Lake trailhead the night before and hit the trail at 4am for what would be a 14 hour day. The first 3.5 miles were in the dark, we reached the lake at 6am. From there the hike slowed with with several broken bridge crossings and a bit of route finding up the Valley of Silent Men. 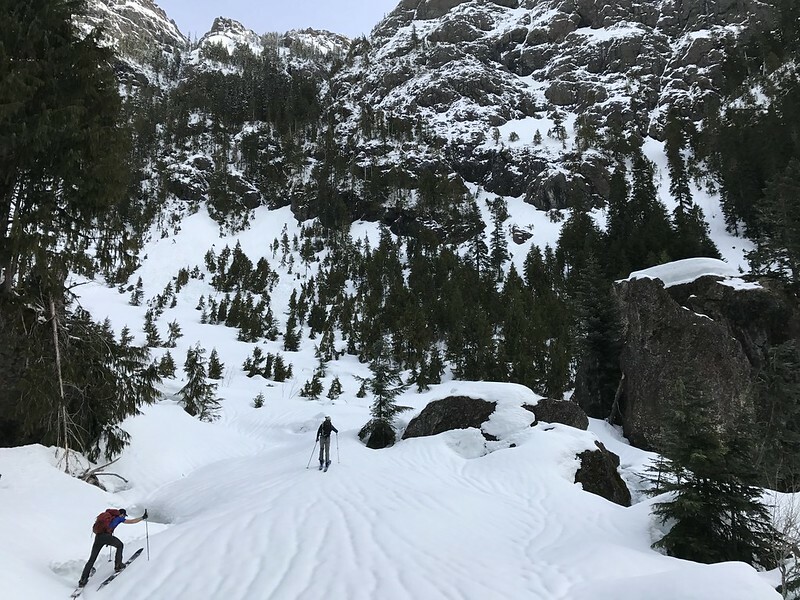 When we reached the climbers camp a little after 8am we had enough consistent snow to finally get the boards off our backs and transition to splitting. We crossed over to the west side of the creek almost immediately and traveled until we broke out of the trees into the basin. 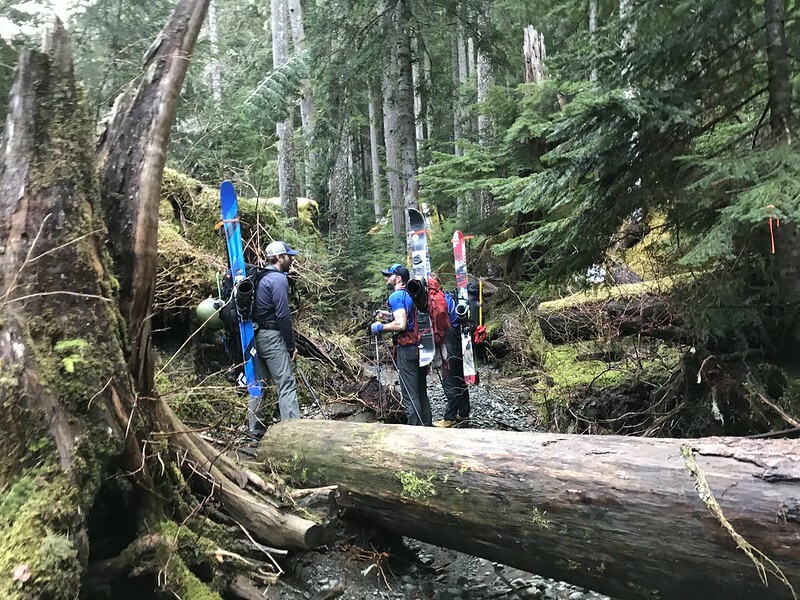 Now we had to deal with some difficult travel conditions in steep brushy terrain and sloppy snow, a lot of which had shedded into massive debris piles during the previous rain cycle. At 5000ft the travel eased up and it was smooth sailing until 6400ft where we switched over and boot packed to the summit, topping out at 1pm. The descent was fast then slow, beginning with spring powder conditions then warming into a mush near 5000 ft. 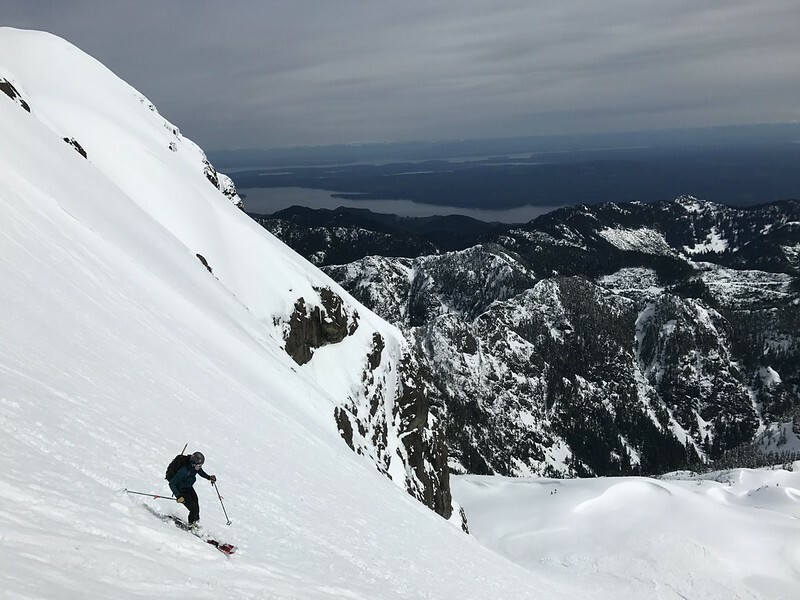 The basin itself is huge and paired with the numerous bulges, windlips and steep chutes that filter into and out of it, it offers a ton of rad skiing opportunities. At 3400 ft we switched back to skins until it was time to put them on our back and make a break for the car. We ended up back where we started at 6pm rounding out the trip with some Milano cookies and a couple beers. I think we’ll be looking at this one for a long time once more until we decide to go for it again. Tagged the brothers, splitboarding, touring, the olympics.